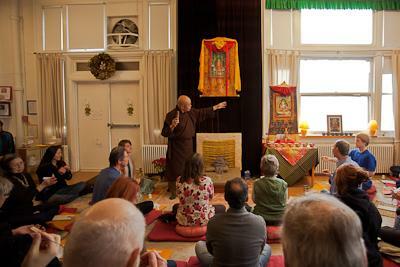 While Buddhist meditators have been prodded and probed by neuroscientists and medical researchers, a wider range of Buddhist practices and rituals have been hailed by practitioners for their healing benefits and are gaining new attention. In the Buddhist magazine Tricycle (Summer), C. Pierce Salguero writes that “Buddhist healing practices that one might think of as more ‘traditional’ have persisted and even flourish, despite being alternately repressed and ignored by modernizers. In almost 20 years of field study and research among Thai Buddhist healers, for example, I have seen firsthand that the entire package of Buddhist healing rites—including the invocation of deities, blessings, exorcisms, cleansing rites, chanting, incantations, binding rituals, the use of talismans or amulets, repentance, and confession—are still highly relevant for most Buddhist practitioners in that culture.” In Thai Buddhist circles, educated people and the media follow the research on the health effects of such practices, and meditation is usually seen as compatible with this range of other therapies. Salguero adds that “Anthropologists working in Myanmar, Taiwan, Japan, in Tibetan communities, and elsewhere around the Buddhist world have reported a similar range of practices and beliefs said to have healing effects— often but not always including meditation.” In researching Vietnamese, Chinese, Korean, Lao, and other temples and comparing them with meditation centers (sanghas) in Philadelphia that tend to cater to non-Asian converts, Salguero finds that the different Buddhists had conflicting opinions about which practices lead to health benefits: “In predominantly English-speaking sanghas, we tend to hear, we tend to hear a lot about meditation…Meanwhile, the groups that are largely composed of Asian immigrants tend to place value on a wider range of practices, including meditation but also rituals, ceremonies and other group activities. Among the former practitioners we often hear about reduction of stress or anxiety; among the latter, we are just as likely to be told about receiving blessings, divine intervention, or good karma.” Salguero concludes that scientists need to study the effects of these practices just as much as they have focused on meditation.